Every business starts somewhere. 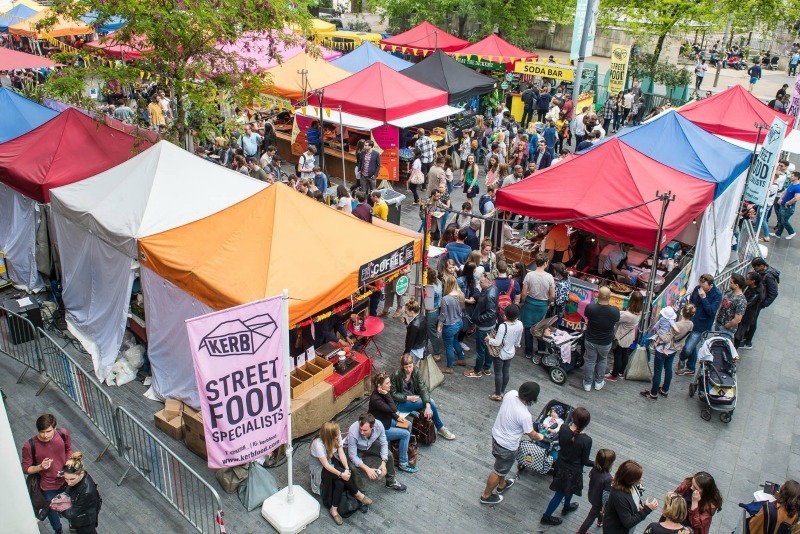 KERB is a London institution, a beloved street food collective that has supported and launched many of the brightest food startups in the business, and what a journey it's been over the last years. Founder Petra Barran shares with us the story of KERB, from the early days to now. My early days in business weren’t really in business at all. It was more of a hobby that gathered pace. An idea that sprung into my head. A hunch of wanting to do more with what I had. It was 2009 and what I had was a chocolate truck - Choc Star - that I had been driving around the country for three or four years, having adventures in but increasingly growing tired of. It was a brilliant vehicle for travel and meeting people and getting to know the world of street food, but I wanted something… else. Not more trucks, not my own shop, something more collaborative and ingrained in the city. The original idea was to form some kind of collective so that myself and all the other brilliant traders I knew could create more opportunities and protect ourselves from what felt like an endless stream of dodgy event organisers by getting joined up and flexing our combined muscle. I named it eat.st and our rallying cry was ‘Driving British Street food forward’. It felt like the start of something great. Over the next two years it went from being a side project while I continued to sling brownies, fudge sundaes and hot chocolate shots, to something with real potential. We scored events and areas in festivals and then our first regular lunch market at King’s Cross in 2011. It was then that I decided to hang up my ice cream scoops for good to concentrate on turning it into a real business - and in doing so, the awful truth dawned on me. My two partners in eat.st and I were moving in different directions and it was never going to work with us all at the helm. Hard conversations and a hell of a lot of stress ensued. Honestly, it was horrendous. Just as things were starting to take off and I could see the path that this idea could take - to grow the number of brilliant street food traders operating in London, to have markets across the city, to bring together people from all walks of life into spaces we created with all this talent, to enjoy London and its culture as told through the food on offer - it looked like it could all end if we couldn’t agree how to proceed. In the end, we couldn’t agree so we dissolved, losing the name but retaining the Twitter followers (me) and the web domain (them). After almost everyone telling me I ‘couldn’t lose the name’, I eventually found the guts to believe that I had enough IP and social collateral to come up with a new name and pursue the vision I’d always had for the idea. KERB was the outcome, and it felt great - a refresh and a step forward. Looking back on it now though, it was pure winging it. By this time I’d found a new team - Millie and Ian - who wanted in on the next steps for this train and who were integral in supporting me as I navigated the switch over from the old to the new, with Rob joining us just as we launched in October 2012. So there we were, a team of four, with about 30 traders on board, buoyed on by a wave of newfound interest in ‘street food’ across the city, and with opportunities flying in thick and fast. We had no office, so would work at each other’s houses. We all did everything. If we were running an event, we all did it. If we were setting up a new market, we all did it. A flyer, we all had a say. New traders, we all had an opinion. Social media, we all had a go (apart from Rob, his pics are way too smudgy!). None of us were trained in business but we knew that we loved the industry. And the people in it. And the potential of growing a street food organisation, designed to advance the quality, professionalism, talent and benefits to London. It felt like a mission! Then we kept on needing more people and more systems and more efficiency. Writing trader rotas on the backs of envelopes and working out quotes based on hunches didn’t really fly after a while. In my head I thought, if we can make it to five years then we have a real shot at being around for the long-haul. That date came last October and though Millie left us to be a mum, Rob and Ian are still deep in the game, along with 17 other team members and a brilliant MD who is trained in business. The days of me just living and breathing KERB, staying up all night working on it all and trying to do everything are gone. So gone that it I’m not even in London but way out in New Orleans, marinating on what’s next. I continue to direct on creative and culture and input on key decisions and growth, but the business is running itself in ways that I could never have imagined. We still are going on our instincts and still operate from a ‘family’-like position with our team and now 80 KERBanists, but KERB is now underpinned by a structure and financial robustness that was absent at the start. The good old days were exciting and special but they were stressful and precarious too - never knowing if the wheels were going to fall off as we careened forward. Change has happened on so many levels and being adaptable to that has been vital to our survival. But what hasn’t changed is the original vision: great food served by great people operating in markets and events all over the city to make London taste better.